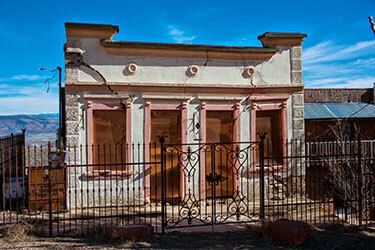 History of Jerome - One of the best hotel in Arizona. 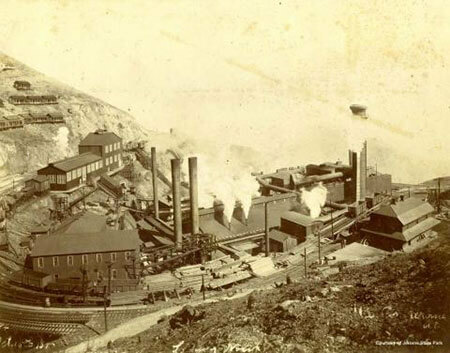 The first mining claims were filed in 1876, but it was William A. Clark who would put Jerome on the map by purchasing the United Verde Copper Company in 1888 for $80,000. Clark was responsible for bringing in the narrow gauge railroad, which boasted 187 curves and 28 bridges in the last 14 miles of its 27 mile run. Before the turn of the century, Clark was netting one million dollars a month! Clark had other more substantial holdings, many in Montana, but Jerome and later Jerome’s sister town, Clarkdale, became Clark’s pet projects. Jerome and Clarkdale received the best of everything and any new technology having to do with mining were used in Jerome. In 1900, the 200 room Montana Hotel opened its doors and was deemed “The finest and most ornate hostelry in Arizona Territory”. Fire destroyed this magnificent building in 1915, but you can still see the foundation. While other mining giants, such as Phelps Dodge, were still using mules to transport ore in their tunnels, Jerome was using electric locomotives and by 1909, Clark had electrified the entire town. By 1916, ore was transported through the 1 1/4 mile Hopewell Tunnel to the newly constructed smelter in Clarkdale. At just under the one mile elevation, Jerome overlooks the entire Verde Valley with views equal to that of the Grand Canyon. Jerome would prove to be one of the richest mining camps in the world, often being called the Billion Dollar Copper Camp. With a population of near 15,000 in 1929, dwindling down to less than 100 in 1955, Jerome now supports its approximately 450 residents through tourism. William Clark and his United Verde Copper Company operated one of the most modern operations known at the time, while maintaining some of the strictest safety requirements for his workers. Housing, pay scale, schooling and medical care were the very best to be found anywhere in the country. Clark pioneered many of the benefits taken for granted today in addition to building the first family planned community in the nation, that being Clarkdale, which was started in 1912 – later incorporating in 1957. 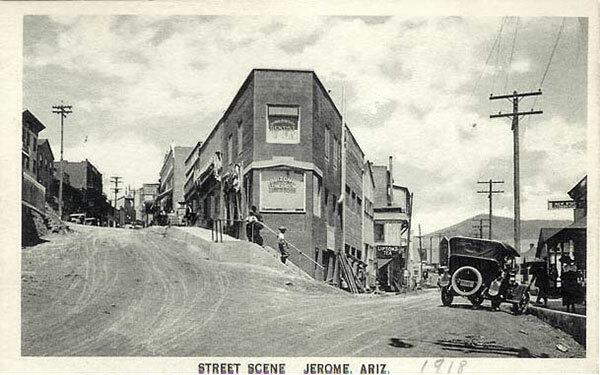 The Town of Jerome was incorporated in 1899, mainly due to fire safety. 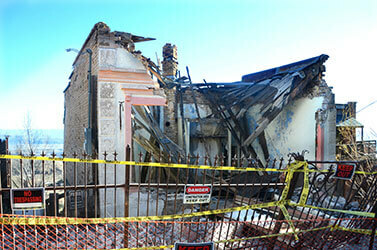 Building codes and their enforcement were a result of the many fires experienced in Jerome. In 1905, the Jerome Town Council even used their power to ban women from saloons. In 1906, the voters used their power to change the Council and the women were back in the saloons ! The United Verde Extension (UVX) started production in 1918 and was headed by James S. Douglas. This added an additional boom to Jerome and was to produce over 100 million dollars by its closing in 1938. The Douglas Mansion is now the Jerome State Historic Park. 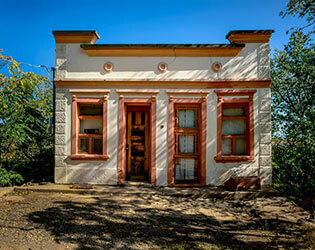 The Jerome State Historic Park is a major asset to our community and provides those interested a look into the history of Jerome plus one of the homes this mining executive maintained. The many artifacts and displays are quite impressive. This was the original smelter in Jerome. 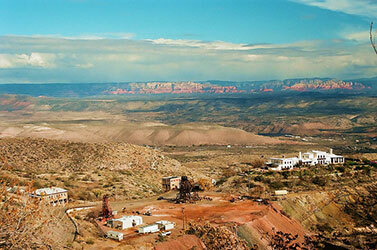 A new smelter was constructed in Clarkdale and fully operational by 1918. 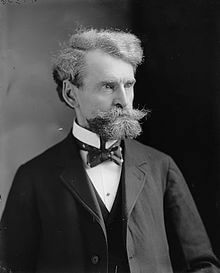 William Clark died in 1925 but was grooming both his sons and grandson to take over his empire. His grandson was killed in a plane accident in Cottonwood in 1932. Clark’s oldest son died in 1933 and his last son 1934. This was in the middle of the depression and Clark’s daughters sold the Jerome holdings to the Phelps Dodge Mining Corp. in 1935 for $22,800,000. Phelps Dodge operated the mine until its closing in 1953, but still maintained all mining rights. In 2007, Phelps Dodge merged with Freeport-McMoRan, and Freeport still maintains a small staff at their headquarters in Jerome. 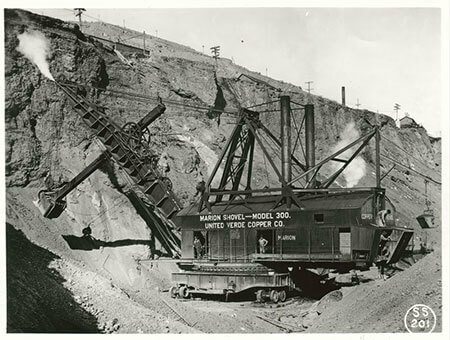 The Marion Steam Shovel was shipped from the Panama Canal to Jerome for working the open pit portion of the mine. The costs are unknown but after striking an undischarged dynamite load, it was destroyed with pieces traveling as far as 1/4 mile and three men killed. The majority of mining was underground ending with 88 miles of tunneling. The mine officially closed in 1953 and with the phasing out of the operation, the United Verde Hospital was closed in 1950 as the hospital in nearby Cottonwood was brought up to standards. A great deal of the Town was built on a cut and fill method. If your building was on the cut portion, you were safe as long as nothing above fell on you. If your building was on the fill side, ground shifting could cause major problems. Even today, due to poor maintenance, poor drainage, poor location or just bad luck, we still loose a building now and then. The front wall of the building known as the Cuban Queen collapsed in 2017. Some say it could have been stabilized but no effort was made and a drainage problem was never addressed. 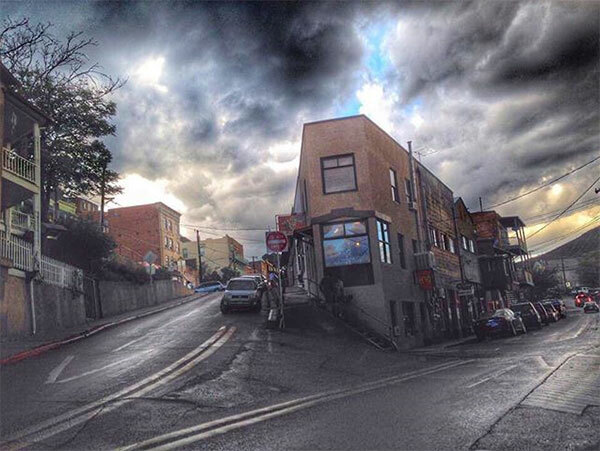 The history of Jerome is about the Town, the mine and the people who lived here. Ruth, a nurse at the United Verde Hospital, started out in Jerome and attended the Jerome High School. Jerome’s sister city Clarkdale, and rival high school team is 4 miles down the mountain. At one football game, Ruth shouted loudest of all, “be sure to flush the toilets, Clarkdale needs the water !!”. Ruth’s father was transferred from Jerome to the smelter in Clarkdale later that year and Ruth had to attend the Clarkdale High School. She said that was a very humbling experience. When Ruth was asked why the last hospital did not have a morgue, she laughed and said there was no reason to keep a body. If they were dead, bury them. She added that the many who gave birth here and the many who were saved here would always remember the care and attention received by all. An old mining engineer living in Jerome, looked up in 1994 and saw the old hospital FULLY lit up for the first time in 44 years. His son said his dad started crying. His dad was taken to the hospital with a broken back from a mining accident in the 1940’s. After major surgery and physical therapy, he fully recovered and retired at a normal age. He was afraid the old hospital would fall victim to neglect and die a slow death. He lived to see it come alive again and would visit during the renovation.